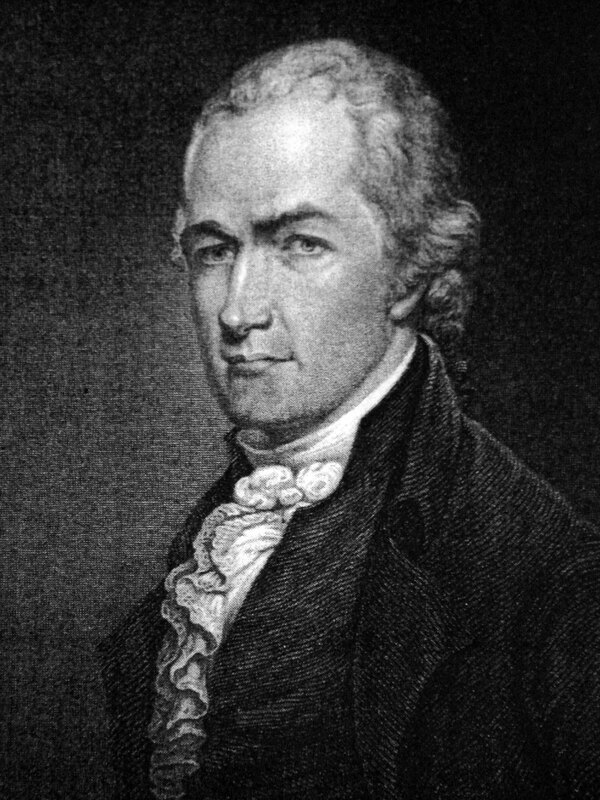 Alexander Hamilton was born on January 11, 1755 on the island of Nevis, in the West Indies. His mother, Rachel Fawcett was fairly promiscuous, and at the time of Alexander's birth she was living with an unsuccessful merchant named James Hamilton. James would disappear for good when Alexander was only 8 years old. Before long Rachel opened up a small store on the island of St. Croix in the town of Christiansted. At this time she inherited 9 slaves that she rented to other households. Three years later both Alexander and Rachel came down with typhoid. Then, after a long week of agony Rachel died. At the time a merchant friend named Thomas Stevens invited Alexander to live with them. Thomas's son Edward was 1 year older, but the two boys looked strikingly similar. This has led many historians to believe that they were in fact brothers. Before long, Alexander became a successful clerk for Nicholas Cruger. Unfortunately, on August 31, 1772, the island of St. Croix was wiped out by a major hurricane and almost all of the buildings and homes were leveled. A few months later Alexander arrived in New York, where he began attending a public school in Elizabethtown, New Jersey. A few years later Alexander would attend Kings College (Columbia)in New York City. However, before he could finish his studies war broke out between England and America. Hamilton quickly joined, and was made a captain in charge of an artillery company. It didn't take long before he saw action. He and his artillery supported the Continental Army and General George Washington in many of their easiest defeats. Then on Christmas night in a battle at Trenton, New Jersey, Hamilton and his guns broke up every attempt the enemy made to form a battle line. Washington noticed, and he soon invited Hamilton to become his aide. At the same time Alexander was elevated in rank to lieutenant colonel. Washington gave Hamilton enormous responsibility. Hamilton never liked the Articles of the Confederation because it lacked the power to collect taxes from the states. He led the Annapolis Convention which called for a new convention in Philadelphia so that a new constitution would be written. In Philadelphia, Alexander would write 51 of the 85 installments of “The Federalist” which called for a new constitution. Then, when George Washington became the first American president, Hamilton served as his Secretary of the Treasury. Almost immediately, he and Thomas Jefferson became bitter enemies. Their feud resulted in the establishing of two political parties. Hamilton who was in favor of a strong central government, became the leader of the Federalist Party. It was Hamilton's idea to reward the rich who invested capital in the United States. Jefferson's party favored an agrarian economy and his party was called the Republicans. In the beginning, Alexander prevailed when Congress approved his idea for a Bank of the United States, a bank that would assume the $40 million dollar Revolutionary War debt. The bank was a big success, and he became very popular. In 1804, Alexander Hamilton helped Morgan Lewis defeat Aaron Burr in a political contest for governor of New York. Angered, Aaron Burr challenged Alexander Hamilton to a duel on the side of the Hudson River in Weehawken, New Jersey. This was the same sight where Alexander's son had died in a duel 3 years earlier. Burr felt that he his honor had been attacked. Alexander fired first and missed, and then Burr took aim killing him.